This sthalam is situated in Andhra Pradesh. It has been constructed in the traditional Dravidian style. This sthalam, along with Thiruppudaimarudur near Ambasamudram and Thiruvidaimarudur is considered an Arjuna Shetram. The three Saivaite saints Thirugnanasambandar, Thirunavukkarasar and Sundarar have sung in praise of this Lord. Adi Sankarar is said to have composed the Sivananda Lahari at this sthalam. The presiding deities are Mallikarjunar and Brahmaramba. Lord Nandikeswarar in the form of a mountain is considered to be holding up Lord Siva. 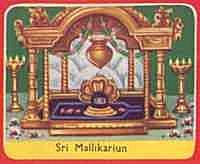 Mallikarjunam has been mentioned in the Thevaram as Paruppadam. The lord is hence known as Paruppadanayagan & the devi Paruppadanayagi. The theertham is known as Paruppadatheertham. When Siva and Parvathi decided to find suitable brides for their sons, Ganesha and Muruga argued as to who is to get wedded first. Lord Siva bade that the one who goes round the world in Pradakshinam could get married first. By the time Lord Muruga could go round the world on his vahana, Lord Ganesha went round his parents 7 times (for according to Sastras, going in pradakshinam round one's parents is equivalent to going once round the world (Boopradakshinam). Lord Siva got Siddhi & Buddhi, the daughtersof Viswaroopan married to Lord Ganesha. Muruga on his return was enraged and went away to stay alone on Mount Kravunja in the name of Kumarabrahmachari. On seeing his father coming over to pacfy him, he tried to move to another place, but on the request of the Devas, stayed closeby. The place where Lord Siva and Parvathi stayed came to be known as Sri Sailam. Lord Siva visits Lord Muruga on Amavasai day & Parvathi Devi on Pournami. The temple is situated facing East. The centre mandapam has sveral pillars, with a huge idol of Nadikeswarar. Ambal's sannadhi is to the west of Iswaran Sannadhi. River Krishna runs along the foothills. Since it runs underground during parts of its journey, It is known as Paadaala Gangai. Devotees believe in a darshan of the the Sri Saila Sikaram from the Sikareswarar temple situated six miles from Sri Sailam.